This last Lord’s Day, I had the privilege to accompany Marsida’s father, Gjovalin, to the ancient Montenegrean city of Rijeka Crnojevica. We left early in the day in order to be back in time for our 4:00 pm worship when the whole family can attend. This was a much coveted time for me, as I have been looking forward to spending time alone with Gjovalin to aid him in learning how to better study the Bible and share from it with his family and what he hopes (as do we all) will be a growing church in this place. Our trip to this city of 200 year old stone bridges over the tip of Lake Skadar, was once home to Montenegro’s royals in an era long past. It is one of the jewels of Montenegro and is well known to its inhabitants; however, few that I have spoken to have had to the opportunity to visit it even though it is less than 25 kilometers from the capital of Podgorica. Some might consider our taxi ride uneventful (other than our need to help herd three cows down the winding one lane road into the village), but I considered it enlightening to say the least. Gjovalin is unabashedly thrilled to belong to the Lord. On our trip to the village he spoke excitedly about his conversion and baptism several years ago when he and his wife Luce accompanied Marsida to Hungary to meet with our sister, Nelda Jo. He spoke of several people in his home town of Tuzi who study the Bible and their wisdom gleaned from scripture. And what his words may have lacked as he spoke of our loving God that would run to meet a Prodigal, his glistening eyes easily conveyed. This is a man who loves God. As we sat along the river that feeds into the lake, we looked together for the first time at the Bible I brought from home for him. A gift from the family of God that meets in Lobster Valley, Oregon, with his name embossed on the cover, he carries it proudly—outside of the briefcase he also carries. Oh, there is room in the briefcase for it—he just has no intention of covering it. Sipping the strong coffee that is the trademark of the Balkans and sitting side by side, we turn the pages of the Word together. He is a quick study as he navigates the chain references, the index and study helps. When I speak of how to learn from the parables of Jesus, he leans intently towards me cupping his right ear with his hand in order to not miss a word. We sit on a stone bench in the little shade afforded from a young sapling tree in a planter—and talk about its stunted growth and eventual death because it will never have the opportunity to take deep root or enjoy the benefits from the rains that run off the pavement instead of soaking the ground. I then point to a massive tree just feet from the lake that shades an entire bank and speak of the importance of being well grounded in the Living Waters that Christ speaks about. He easily understands Christ’s usage of everyday encounters to teach the Good News. Gjovalin then shares with me a story that may be familiar to a few, but needs to be heard by many—especially teachers who often think that because one does not respond to the Gospel immediately that somehow they have failed in the teaching. Gjovalin tells me that twenty years ago, “Peggy from Ohio” (he has long lost her address in the move from Albania to Montenegro) sent him in the mail a WEI course and a tape that he played over and over again. I would say that he is a “self-taught man” when it comes to English (he speaks often of his Oxford Dictionary), yet God knows—and perhaps now in the reading of this article, “Peggy from Ohio” will also know that “self-taught” isn’t entirely accurate. He spoke of how he would write “Peggy” and she would send him more tapes and he would do his lessons in English and in the Bible. Hard economic times, a move from one country to another and the accompanying family hardships have a way of taking their toll. Yet, fifteen years later, his daughter Marsida would express a desire to learn English—and Gjovalin recalled “Peggy” and the WEI lessons from years before. He sends her, now via the internet to learn, where she becomes a student of Nelda Jo. Months later, Marsida becomes the first known member of the Lord’s church in Montenegro. Nelda Jo speaks of the times when she was teaching Marsida and her mother, Luce was seen on Skype and listening to the lessons. Then, two years later, with Marsida helping and with the Lord’s leading all the way, Gjovalin and Luce travel to Hungary and are baptized into Christ. Peggy—did you know? 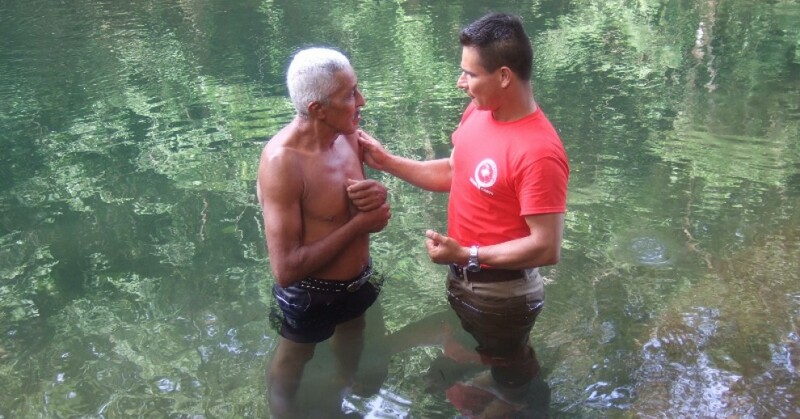 Did you ever think that perhaps your teaching and sharing the Gospel of Christ to a man in Albania decades before would result in the planting of the Lord’s church in the country of Montenegro? The church, as well as we know, is three strong in this place. Seeds are being planted from far away, and in person now and in the past. We may not have the blessing that Nelda Jo has had, seeing it sprout and take root in the life of a babe in Christ (who teaches others now, by the way). But our calling is to plant. The Lord will give the increase. He calls us to be faithful to the task—and trust in faith His Word that says, “so is my word that goes out from my mouth: It will not return to me empty, but will accomplish what I desire and achieve the purpose for which I sent it” (Isaiah 55:11).